Armor pieces made from Worbla. 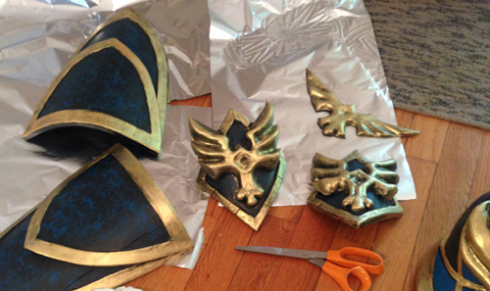 This guide is for making a work space for using Worbla’s Finest Craft in your home. In case you haven’t heard of it, Worbla is basically thermoplastic that comes in sheets. I’ve been using it a lot recently to craft cosplay armor. When heated, Worbla can be molded into whatever shape you want and becomes rigid when cool. It is really great, because it is easy to use and doesn’t put out toxins while heated like some of the other crafting materials, like foam or PVC sheets. 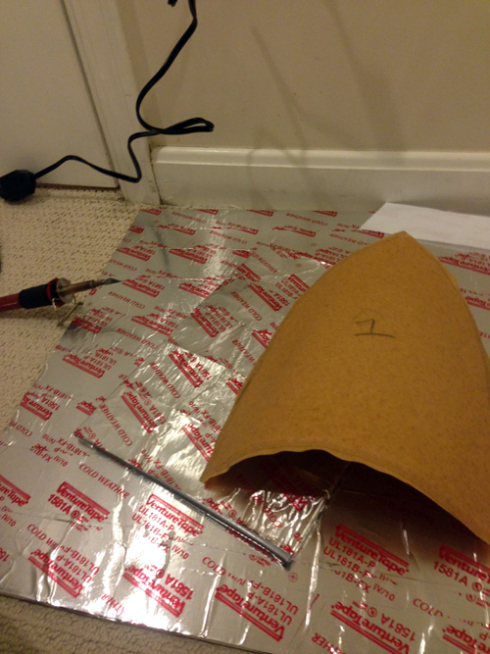 The easiest way to shape Worbla is using a heat gun (or hair dryer in a pinch) and heat knife. The drawback is that both these items create a lot of heat and heat BURNS things. Heat guns, in particular, can burn things without you even realizing it. This creates the problem of figuring out where to put your Worbla to heat it without setting things on fire. 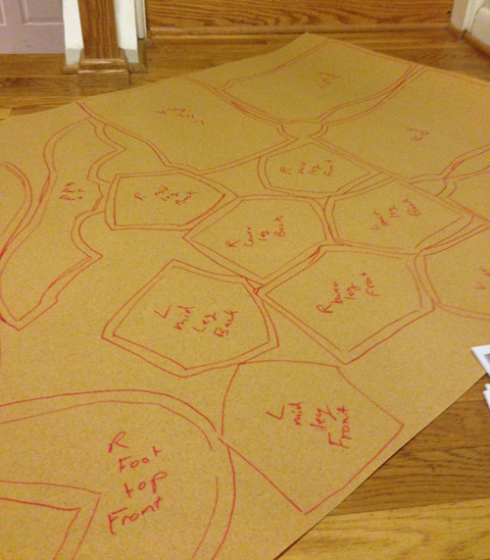 A sheet of Worbla ready to cut out. How to make a costume cost an extra $2500 -basement carpet replacement! I know this from very personal and painful experience! (Yes, that was Berber.) Clearly carpet makes a poor work surface and wood and vinyl are not any better. Cool metal or smooth stone work surfaces work best. Unfortunately, I don’t have a garage with a nice cool cement floor or metal table to work on, so I make my own aluminum workspace that I can move to wherever I am working that day! To make it, I start with a foam display board from the craft store that is big enough for the Worbla pieces I’m working on. Then, I wrap it in metal insulation tape. A slightly blurry craft board with duct insulation tape on it. That’s all you need to do. Metal insulation tape is available at any hardware store and is used to seal ducts. Note: it is not duck tape. Duck tape sheds water like the skin of a duck. 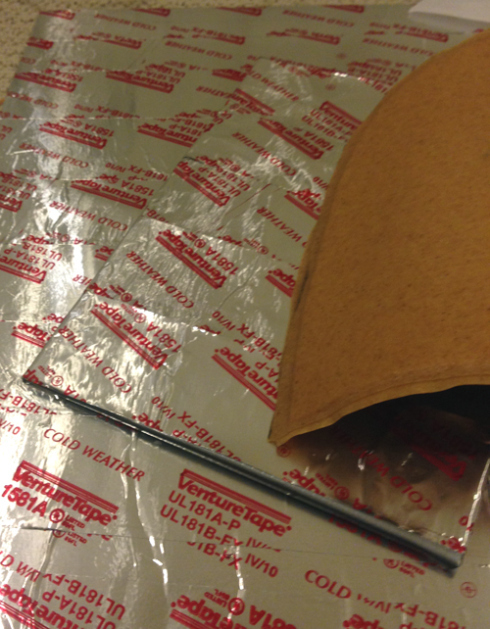 This is the shiny aluminum metallic tape used for heated HVAC ducts. Prices for this vary, and at $6-$15, it might seem expensive for a roll, but weighed against the damage you can create without it you are getting a bargain! 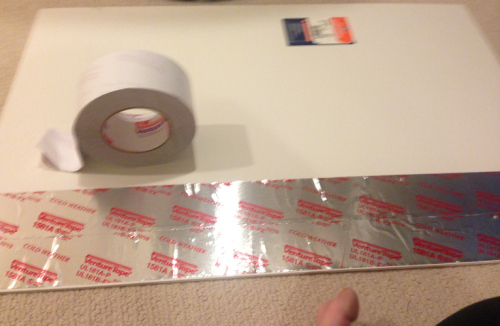 If the tape is impossible for you to get, you can also wrap the board in aluminum foil. 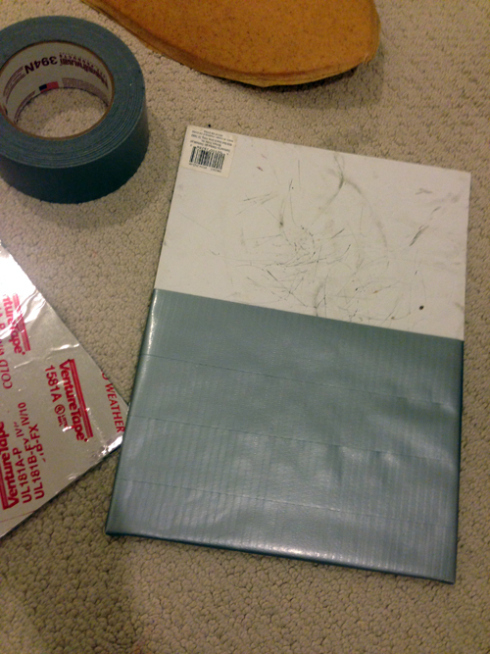 However, the tape is much better and much safer, because it stays securely in place. 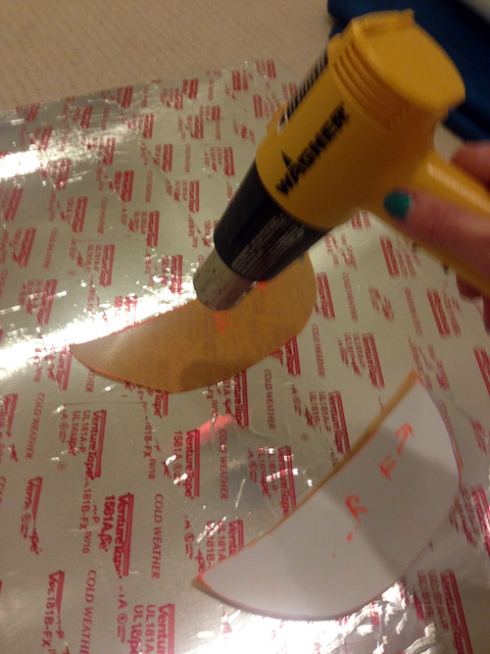 Heating a piece of Worbla on my new board, keeping finger out of the way. And Voila! You have a mobile workspace! The heated Worbla will not stick to the aluminum tape and the board will not catch on fire with the heat gun or knife. The aluminum will reflect heat when you hit it with a heat gun, but this actually helps you heat up your Worbla more evenly. Watch out for your fingers! The board can get hot. Make sure to heat things in the middle of the board to avoid inadvertently hitting what’s next to your work surface with the heat gun. 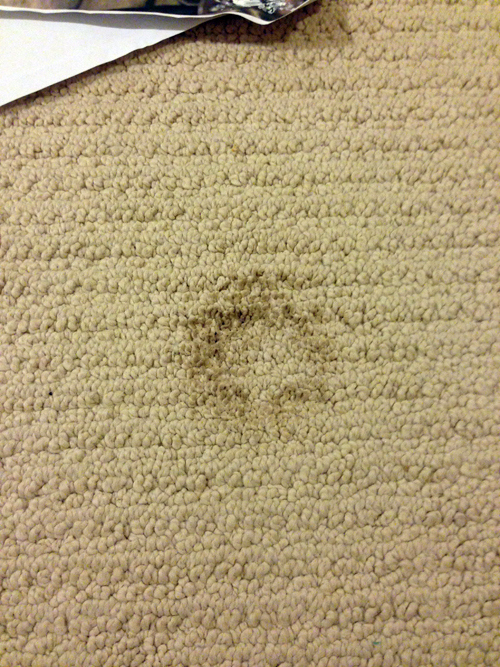 It just takes a few seconds of even indirect heat gun heat to discolor most carpet, vinyl or wood. The metal tip of your heat gun is REALLY hot! When you are done heating, don’t set it down anywhere but on the aluminum board. It will insta-burn through carpet. And for heaven’s sake do not touch it! This goes for heat knifes, too. If your aluminum board is losing pieces of tape or looking a little worse for wear, there is no need to replace it, just add more aluminum tape. Keep a bucket of cool water handy to dip your hands in when they start getting a little too warm and to treat burns with immediately. The large board we just made is great for heating, but will not last long if you are cutting into it excessively. I make my cutting board out of a 4ml piece of foam. I wrap the foam first in duck tape to add rigidity. You can tell I have used this foam for cutting before. 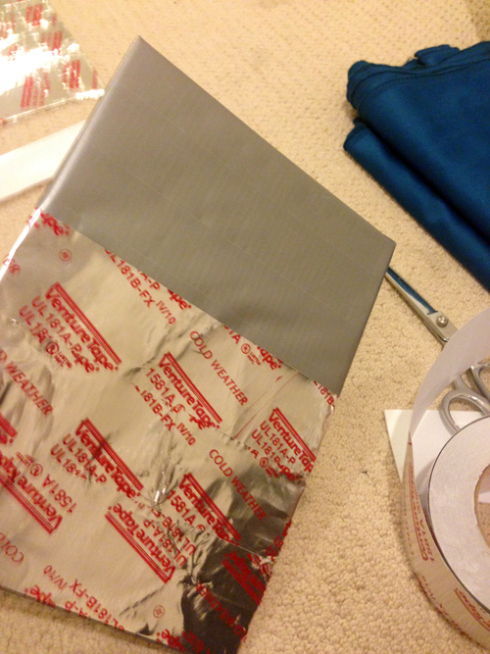 Then wrap the whole thing in Aluminum tape. This gives me a surface with give that I can cut on multiple times. I usually set it on top of my rigid board, so if I accidentally cut through one board I will hit the other. It is also nice to use it as a heat gun holder while heating so you can set your heat gun farther from you while shaping your Worbla. When the tape starts getting too cut up to stay together, you will need to re-tape your cutting board. That happens a lot, which is why I like using a smaller board for cutting: less tape. In an ideal world, I would have a giant aluminum work table and could luxuriously stretch out my Worbla, shaping it to my every desire, as I casually fling around my heat gun like Han Solo would a laser gun. That dream, however, would require a garage and possibly burn defying superpowers. In the meantime, I find this to be a good work around. I hope this is helpful and if you have any questions or suggestions on avoiding burns or even your favorite home cosplay catastrophe stories, please post a comment! To find out more about the author, visit Katilist Cosplay on Facebook.